The Seahorse has received a long awaited refurbishment, new wood style flooring, couple of comfy lounge seats and new tables and stools dotted around, both in the latest brown of course. Change s now returned to you in a steel dish in an All Bar One style experience, which does sit quirkily with the dartboard on the right of the bar. The bar still serves London Pride although at a temperature which would not see them gaining the Cask Marque, it never really seemed to clear, which may have been the temperature but it tasted okay. Oh, and the fruit machine by the door, that's gone too. 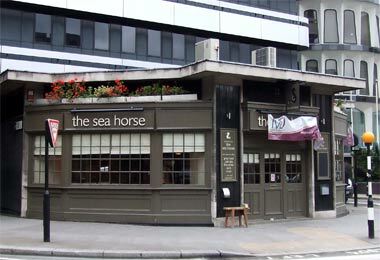 Being one of the, if not the, sunniest pubs in the City, The Sea Horse now offers modest modern surroundings to enjoy a beer. If you do get bored with The Sea Horse surroundings, take a stroll across the road to Cleary Gardens where you will find Loire Valley vines.